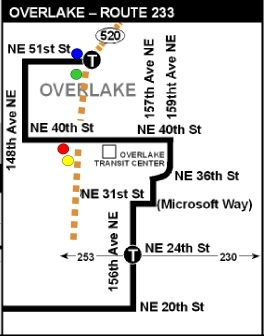 Or you could catch the 233 at the Bear Creek P&R (at 178th & Union Hill Rd, near the Target in Redmond) and get to campus directly in less than 15 minutes. True, but the Redmond P&R is directly on the route that my wife drives to take our son to preschool. The Bear Creek one is out of the way. And I wouldn't get the psychological thrill of hitting the connection just right.